Guo Yue holds an IBM first laptop computer PC5140 year 1986 model while being surrounded by his collection of other IBM laptop model at his home in Beijing Saturday, Dec. 22, 2007. 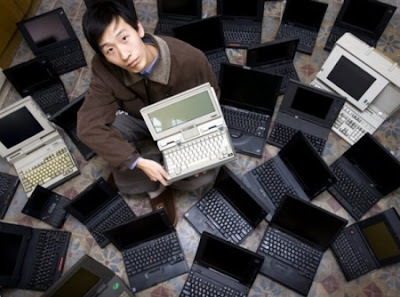 Guo, who works for Beijing Administration for Industry and Commerce Foreign Investment, started his collection of IBM laptop computers since 2004. Majority of the laptops he bought are from the second hand market. He have collected more than 80 different models and he fixed them by himself, and most of them are still in working condition.